1′ 6″ h, 12″ dia. The piece “insisted” upon portraying my vision of a released-energy glass sculpture. I will admit, getting from my inspiration to the “materialized” work in wax was a real challenge. I could see a gathering of energy thrust vertically. A pile of ribbons that broke loose in an updraft and wafted skyward. But both of these are appreciably different feelings – one dramatic, the other almost dream-like. Yet both were compelling factors in my design of Escape Velocity. Although somewhat influenced by Blue Tango, its predecessor, Escape Velocity attempts to capture a dynamic release of energy with livelier elements and more open structure. I was further inspired by my love of acrobatic flight at air shows. I had long thought of trying to capture the essence of that aerial ballet. Two aircraft coming from opposite directions with smoke pouring out. High-speed closing rate barely missing, then joining together in a tandem vertical spiral. I’m not sure which occurred to me first – the feeling of powerful motion or the name, but “escape velocity” refers to the speed that must be achieved to escape the gravitational pull of the earth, without further propulsion, to join the cosmos. 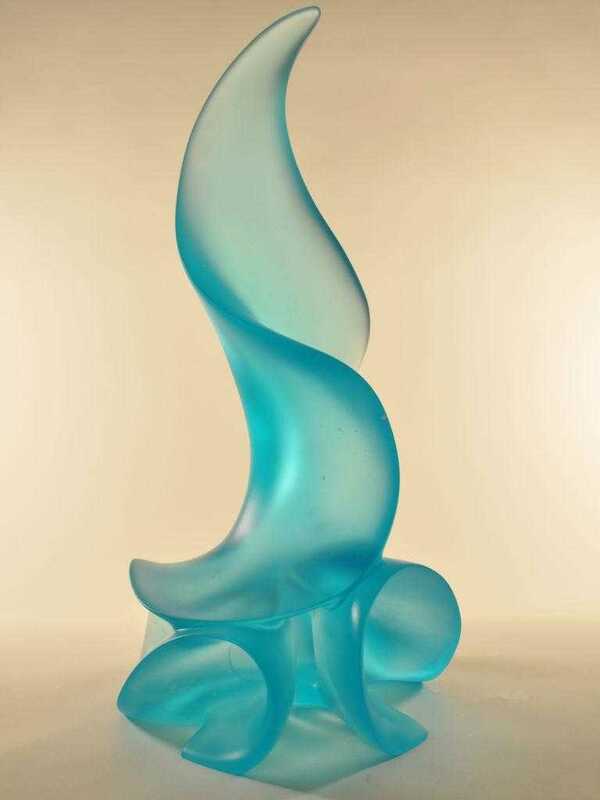 It’s my #25 glass art piece and my first use of the color Pale Copper Blue which turned out to be magically translucent. I said on my Home page that if I’m not a little bit scared, I’m not doing good work. Well, this one had me scared. It wasn’t until I got the wax form down to 9 lbs that it started to make it. Somehow it’s the scary part that really drives me. Waking up at 3:00 a.m. and having to go “chase it.” That’s what I did this particular morning…captured, unbeknownst to me, by my wife, Gaye. The images below track the work in progress. 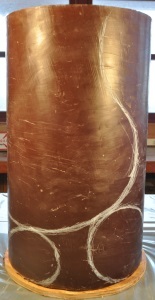 The 55 lb wax blank with a few design lines to the 9 lb completed rough sculpture at 20″ tall and 10″ diameter. 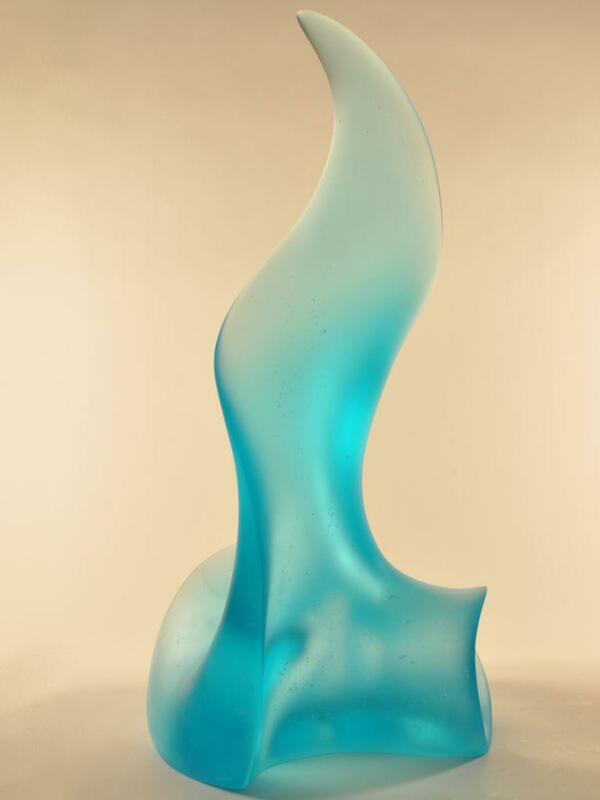 And the rough glass sculpture back from the foundry still coated with casting material.